WE’VE ALREADY HAD a bar of chocolate inspired by the Proclamation – now get ready for a beer that pays tribute to the Easter Rising. 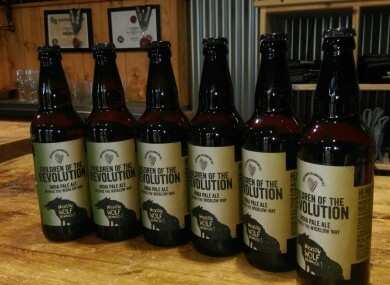 Bray-based Wicklow Wolf Brewing Company have released the latest in their IPA series, Children of the Revolution, which combines Irish malted barley with English hops. “We wanted to mark, in our own way, the bravery and vision of our countrymen and women who made possible the Ireland we live in today,” explained Simon Lynch, who co-founded Wicklow Wolf alongside Quincey Fennelly. However, the drink has already had to face the ire of RTÉ radio listeners when the appropriateness of its name was called into question on Joe Duffy’s Liveline earlier today. A number of members of the public, and host Duffy, questioned how appropriate it was to include a reference to children in the marketing of an alcoholic drink. Following a query from TheJournal.ie, a spokesperson for DrinkAware.ie said that it did not currently have any guidelines that would rule the name inappropriate – although it’s possible such rules may have existed under MEAS. Under section 9 of the rules by the Advertising Standards for Ireland – which lay down the law for alcoholic drinks – no specific reference is made to mentioning the word ‘children’ in branding. So what exactly is so 1916 about this beer? “It’s got ingredients from both sides of the conflict,” Lynch told TheJournal.ie, saying the reaction to the €3.95 beer – available in O’Briens and Molloy’s off-licences and in leading independent off-licences nationwide - has been “great so far, super – people really like the beer for a start, and really like the sentiment. It’s acknowledging what the 1916 leaders did for our country. Not only has Ireland seen significant cultural change in the form of religious tolerance, civil liberties and marriage equality but Ireland has also left a huge imprint on the world through its people, music and the arts. All of which came about as a result of those words read out on the steps of the GPO in 1916. The company brewed its first beer in 2014. Lynch said there is “a beer revolution taking place in Ireland as people seek out new styles and flavours and move away from mass-brewed beers”. Lynch that at Wicklow Wolf they make a concerted effort to source as many locally-produced ingredients as possible, and also grow some of their own hops. Email “This 1916 Rising-inspired beer caused quite a stir on Liveline today”. Feedback on “This 1916 Rising-inspired beer caused quite a stir on Liveline today”.